Having spent two years in hiding, Wynn is desperate to test out his newly constructed arkship, the Vengeance, and put a stop to the expansionist ambitions of the House of Draig. But Wynn’s first skirmish exposes his lack of experience, and his plans for revenge soon lie in ruins. Hunted, outnumbered, and on the brink of extinction, Wynn must find a way to save his family and friends before the House of Kenric is lost forever. 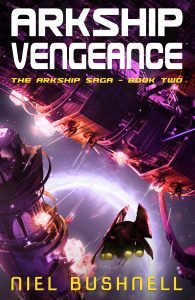 Arkship Vengeance is the second book in the highly acclaimed Arkship Saga series. If you liked Battlestar Galactica, Isaac Asimov’s Foundation series or The Expanse then you’ll love this page-turning saga from award-winning author Niel Bushnell.